It’s Friday! yay!! I am really enjoying weekends so much more lately. We are going through a bit of an issue lately and it’s just good to spend time with my husband. I hope you have a gorgeous weekend as well! I have a folder on my computer called “File 13”. It’s the folder where all the photo’s get thrown into of nail art that I didn’t like or didn’t use. I thought it was time to bring some of those out and show you. For most of them, it will be pretty obvious why they never made it onto the blog. Some of them are also from ages ago so might look a little different. Let me show you. I did this using Sinful Colors – Rise & Shine and Snow me White. 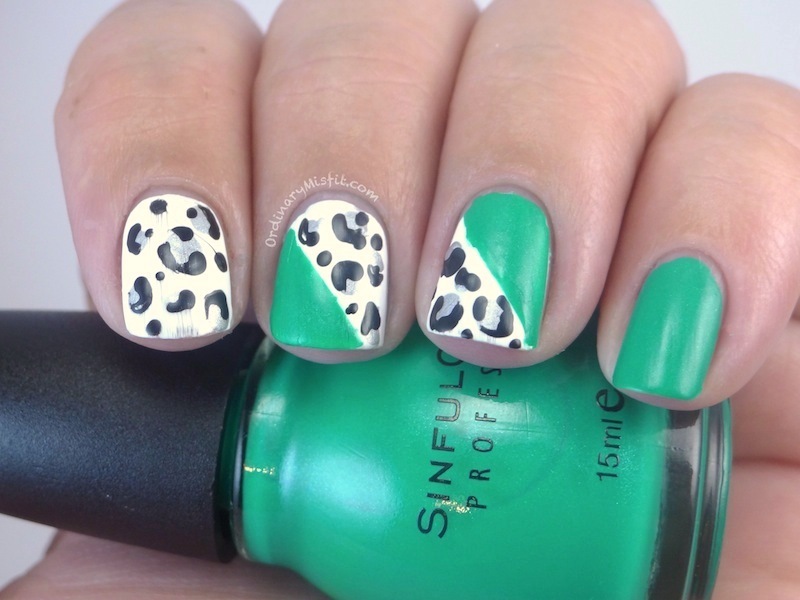 For the leopard print I used Sinful Colors – Black on Black and Casablanca. I did this because I have an outfit where the top is this bright green flowy long shirt that I wear with my leopard print leggings. Here the leopard print dragged so badly when I topcoated it. No surprises why this one didn’t make it right? 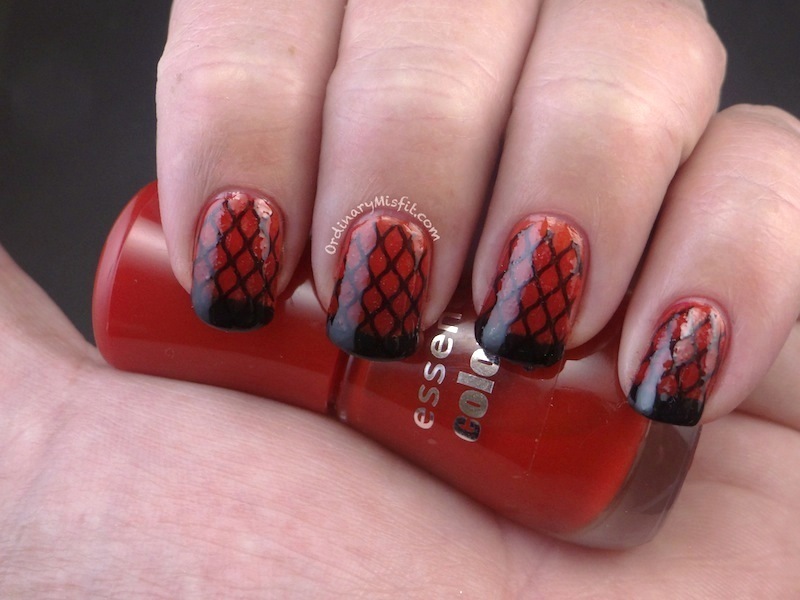 I used Essence – Redvolution and Fame Fatal and Black is Back to do a sponged gradient. I topcoated it before the stamping and as you can see I had lumps and bumps and bubbles everywhere. I have no idea what went wrong. It didn’t even look that bad at first but on the photos it’s all I see. I used Pueen25 to stamp the pattern in black. I really loved the idea behind this but it just did not work. I don’t know if the stamping pattern is too busy or the polish underneath is too much. Here I used a matte top coat and it is the only time this looked a bit better. 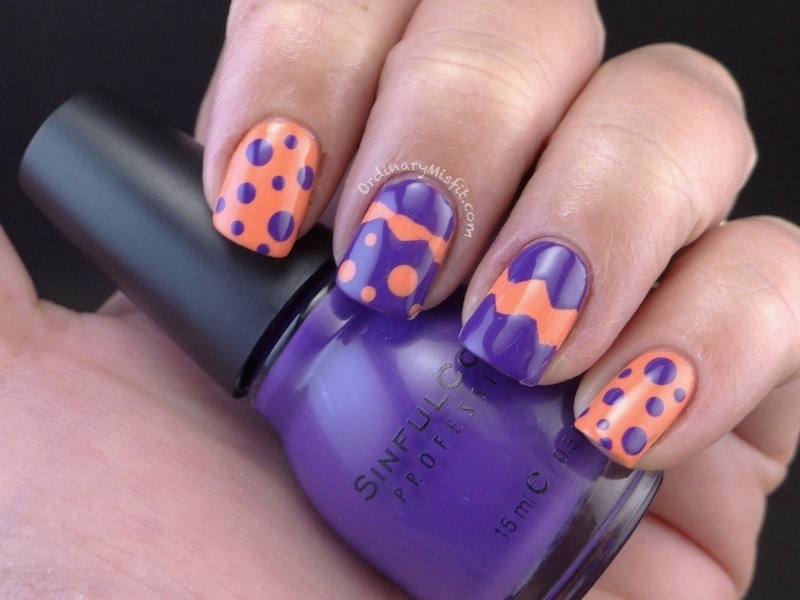 I used Sinful Colors – Sugar Sugar and stamped using Pueen02 and black. On my ring finger I used striping take and then Sinful Colors – Black on Black. I just don’t know about this. Still very hesitant to even put this one up here. The polish is Sinful Colors – Show me the Way. I didn’t think it would be such a bright green but it is packed with gorgeous shimmer. 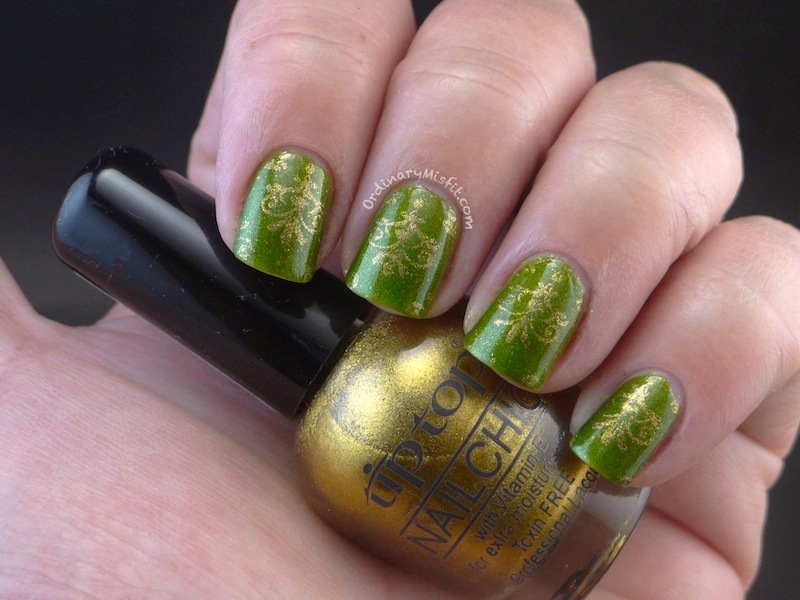 I stamped using pueen23 and Tip Top – Gold Digger. I absolutely loved this. I wore it for forever and got so many compliments on it. In real life it was fine and it looked good but on closer inspection you can see the flaws. On my ring finger you can see the thickness, almost bubble like, near the tip. I had a few similar patches in other spots. Only the really big one near the tip of my ring finger really bugged me while having it on but I still loved the combination of colours. I used China Glaze – Glistening Snow (silver glittery) and China Glaze – You Drive Me Coconuts (pink) together with Sinful Colors – Snow me white. This was my first idea for day 5 of the M.T.V Challenge: Blue & Delicate print. There wasn’t anything really wrong with it. I just came up with a better idea. 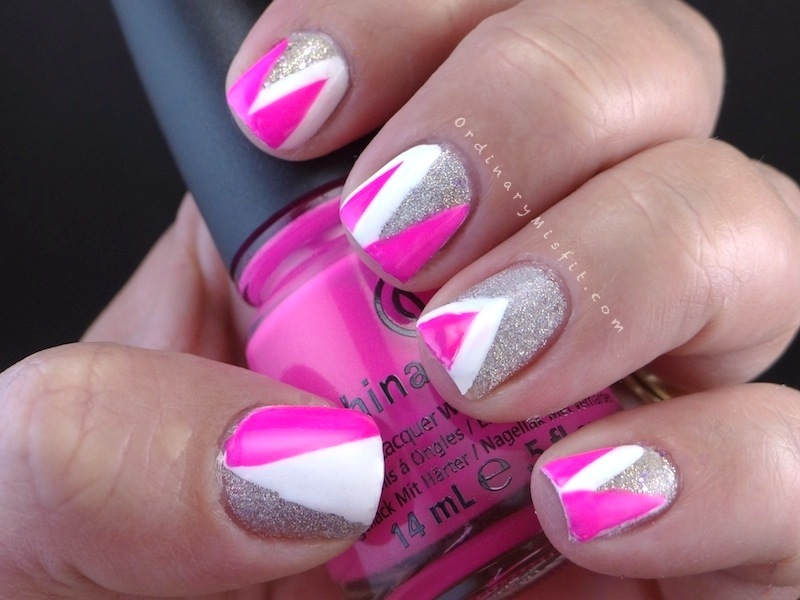 Here I used Tip Top – Beach Babe on my index and pinky. 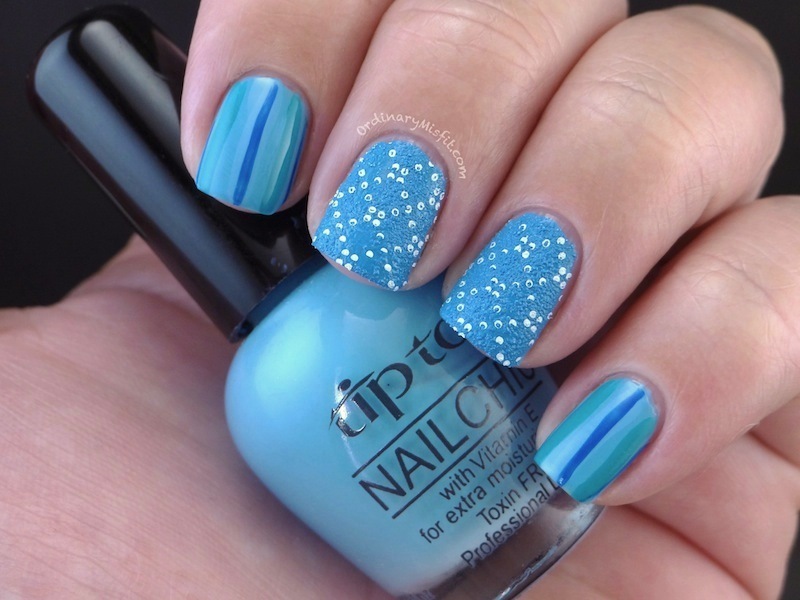 I used 3 L.A Colors stripers in different shades of blue to make the stripes. I used China Glaze – Of Coarse textured polish on ring and middle finger. I then stamped using Pueen07 and my Essence white stamping polish. There we go. What do you think of these that didn’t quite make it into it’s own post? Any of these you think I should redo and update? Let me know in the comments. Have a great weekend everyone and be safe! You are a silly wench. These are all bloody lovely. A few of these def needed a post of their own. Especially the blue one… Wow! Hope you have a fab weekend and enjoy spending time with hubby. Thank you so much Lynette. Hope you have a great weekend as well! Hahaha thanks so much Kerry! You are too kind! Squeaky Q recently posted…So Many Dots! Hahahahaha thanks V. I wore that first one for a week! I have to agree with acidicice…I still love all of these, hahaha. Thank you for sharing them! M, Emmy, Schmemmy, Michelle…ARE YOU OUT OF YOUR MIND?? These came out gorgeous! All of them! 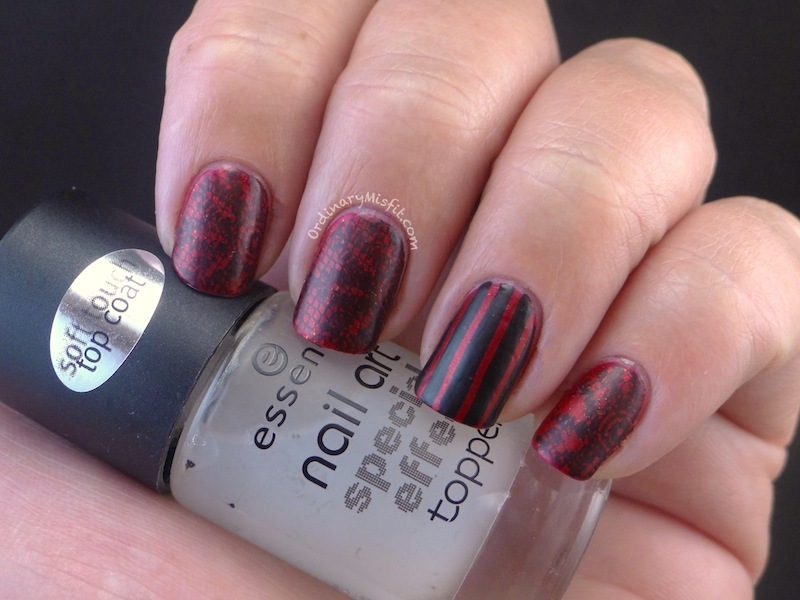 And that black stamping with the red is killer! Love them all! I actually REALLY like that green and gold one, such cool colours together! And the blue one? Great patterns, go really well together! The purple one, was that created around Easter ? Anyway, Awesome. Aw thank you so much Catherine. I actually can’t remember if the purple one was around easter but now that you mention it it looks very easter-y huh!